Shayla, 24, of Diamond Creek has cerebral palsy and needs assistance to walk and with her personal care. Shayla’s mother said being able to store the bike in the shed would mean more frequent rides in a safe off-road environment for her daughter. “Biking is Shayla’s favourite thing in the world, followed by swimming,” Ms Meredith said. The storage shed is a great step towards ensuring community facilities are accessible to all. “I’m hugely grateful that the shed is being built,” Ms Meredith said. 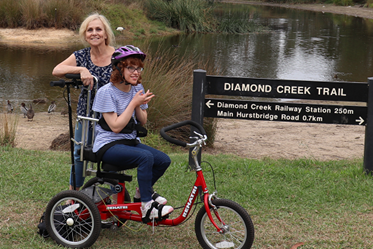 Chair of the Inclusion Advisory Committee, Councillor Jane Ashton said given the Diamond Creek Trail was the most popular trail in Melbourne’s north, it was wonderful the shed could be used to make biking easier for people of all abilities. “It means so much to families who have to battle transporting these cumbersome bikes around. It’s wonderful to be able to help out,” Cr Ashton said. The Brotherhood of St Laurence are the local Partners in the Community in the delivery of the National Disability Insurance Scheme (NDIS) in Nillumbik and across the North East Melbourne Area. In addition to supporting people with a disability access the Scheme, the Brotherhood is also working in partnership with local councils and community groups to identify opportunities to make our cities and communities more welcoming and inclusive for all people.